Nalboor Tiles Bianco Dolomoti Bianco Dolomiti Marble Supplier in the U.S.
Bianco Dolomiti Marble Supplier in the U.S. When you’re working on an outdoor living space or it’s time to upgrade the flooring in your home, consider the beauty and durability of natural stones. Bianco dolomiti marble is one of the best options available for countless projects. Install it around a pool deck or as the flooring of your outdoor kitchen. Brighten up your front porch by installing it over the existing concrete. You’ll add sophistication and an elegant look to any room in your home, and your customers will be thrilled with the finished look if you use natural marble in your renovation and remodeling projects. When you’re buying any kind of building material, you need to find a supplier that will provide you with great service and help you save money. Before you visit the local home improvement stores, learn more about wholesale options that everyone can take advantage of. People who are in the business usually buy in bulk, so they’re able to work directly with wholesalers. Typically, these middlemen sell directly to a select group of people to help them save money. However, Nalboor is a little different from the wholesalers you may have worked with in the past. We’re able to meet the bulk needs of architects, designers, and builders, but we also allow private homeowners to take advantage of our great prices and services. Our rates do drop as the order sizes go up, but you’ll find that our prices for small orders are still more affordable than most retailers and local stores. We’ll help you save money whether you’re working on a tiny project or it’s time to invest in something major. If you’re in the construction trades, then you may want to develop relationships with suppliers so that you can continue saving time and money over the coming years. We’ve been in the same location since 2005 and we’re looking forward to remaining in the Miami, FL area for many years to come. This makes us easy to find if you’re ready to place another order in the future, decide to carry the bianco dolomiti marble into another area of the home, or you need to replace a few damaged tiles. We take pride in our excellent customer service, and we strive to provide you with a consistent inventory that will meet your needs now and on future projects. 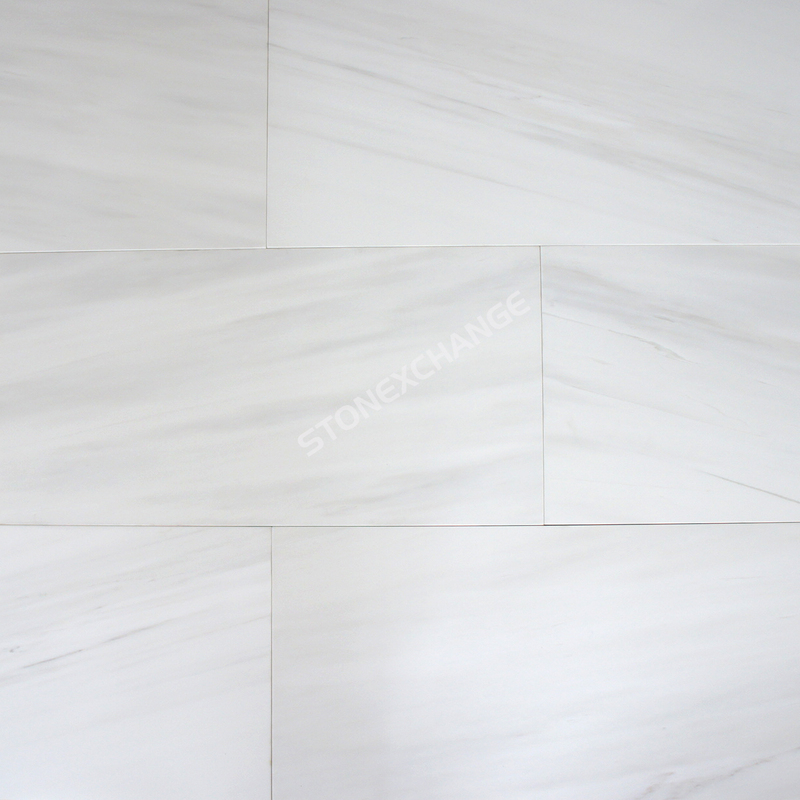 We’re a subsidiary of StonExchange, and we own our quarries where the marble is mined. We have teams of experienced professionals who take care of all our manufacturing needs. This allows us to develop and maintain the most stable inventory. We’ll be able to fill your order today, and you can count on us to have more of the marble tiles you need in the future. We offer a range of different sizes, but we know that you may need something a little different for a special project. Whether you need a special shape or just a larger size, we’re happy to accommodate you with special orders. We ask that you allow us a few weeks to fill the orders, but you can rely on our professional team of manufacturers for high-quality work and close attention to detail. You’ll receive the same beautiful finish that’s available in our Miami warehouse, but the stones will be cut according to your specifications. There’s a minimum ordering requirement for custom pieces, but our customer service representatives are happy to help you place the order and discuss the special requirements for these orders. Choose from tumbled or polished stones depending on your needs. While polished stones are beautiful and sophisticated, they aren’t the best choice for exterior applications. Tumbled tiles have a roughened surface that is ideal for areas that will see regular water and moisture. They provide you with greater traction, and we carry a handsome selection of tumbles tiles. You can use them around the pool deck, for garden walkways and throughout the patio. Highly polished stones are the best choice for shower walls, foyers and other spaces where you want the smooth finish and clean look of a highly polished surface. Most retailers are happy to close the deal, but they cannot always provide you with the support that you need. Our consistent inventory means that it’s easier to find replacement stones down the road should you need them. We also offer a full inventory of high-quality maintenance products that are carefully formulated to keep your marble floors looking incredible. This includes formulas to clean, polish, shine and waterproof the marble. We also sell special formulas that will give your stones a little more traction so that you can make your bathroom and kitchen safer. Here at Nalboor, we value our customers and aim to provide them with excellent service. We pay close attention on all orders because we want to ensure that your needs are met. We’re able to maintain high quality control standards from the initial mining process through to the final delivery, so you can count on us for quality stones. We take great care while packaging the orders to minimize breakage and losses in shipment. We’ve contracted with some of the top shipping names in the country, so we’re able to bring you lower rates and faster delivery times. You’ll be treated with respect and courtesy along the way because we want you to be completely satisfied with our service. Whether you’re considering bianco dolomiti for the bathroom or you’re going to finish your front patio in this beautiful stone, you can count on our team for quality merchandise, excellent service, and wholesale pricing. We’re happy to serve people across the nation and even in the Caribbean. Your satisfaction is our top priority, so call Nalboor today to place your order and see how we can help you take your net project to a higher level.